Amongst any organizations’ myriad tasks, ‘Strategy Development’ is fundamentally the most challenging one. 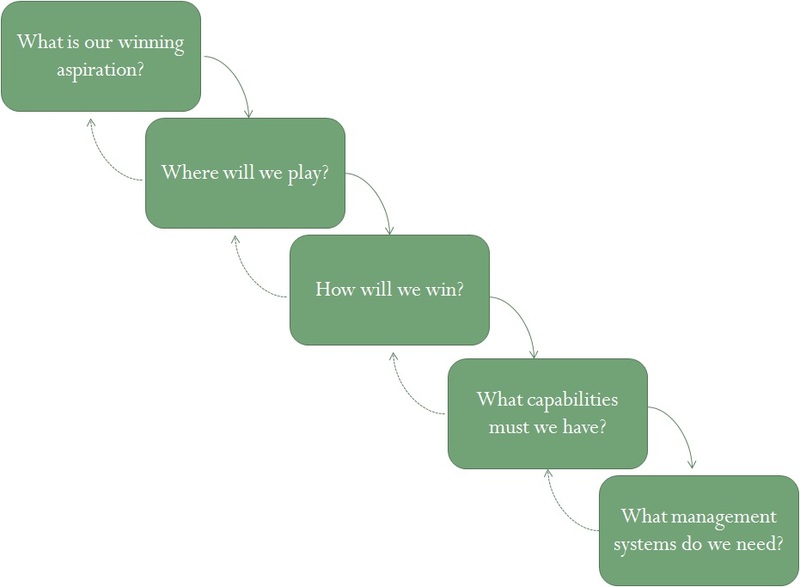 As per ‘The Cascading Choice’ framework for strategy developed by A.G. Lafley and Roger L. Martin, explained extensively in their book Playing to Win, there are five key choices which have to link together and reinforce each other, thereby making the strategic choices simultaneously and not sequentially. How will we win where we have chosen to play? What management systems are required to ensure that capabilities are in place? Can we create the Management Systems to support – build and maintain -the necessary capabilities? Those ‘Where to Play’ and ‘How to Win’ possibilities, for which these questions can be plausibly answered in the affirmative should be taken forward for more consideration and exploration. Moreover, no meaningful ‘How to Win’ choice exists outside the context of a particular ‘Where to Play’. Despite what many think, there are no generic great ways to win viz. being a first mover or a fast follower or a branded player or a cost leader. All ‘How to Win’ choices are useful, or not, depending on the ‘Where to Play’ with which they are paired. A ‘How to Win’ choice based on superior scale is not going to be useful if the ‘Where to Play’ choice is too concentrate on a narrow niche, because that inherently would undermine any attempted scale advantage. It doesn’t matter whether the strategic question is to aim broadly or narrowly, or to pursue low costs or differentiation. What does matter, and as discussed above, is that the answers are in perfectly matched pairs. The team at Actuate Business Consulting, a knowledge based management consulting firm in India, believes that ‘Strategic Planning’ is exhilarating, in the same vein if not considered carefully it can also be the source of failure in future. The Strategic Choice Cascade is a perfect blend of Vision, Strategy and Planning; when meticulously thought through, these questions reduce risk of failure at the execution stage. I have learn several just right stuff here. Certainly price bookmarking for revisiting. I wonder how a lot attempt you put to create this sort of fantastic informative web site.